Made specifically for match rifle shooting, but suitable for anything where you need the top tier accuracy that the Hornady AMAX and the associated high quality components can offer. 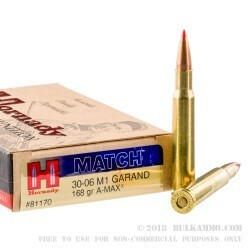 This is absolutely suitable for hunting, but with the .30-06 most game that you’d be after will not need the sub MOA accuracy that this round can deliver. Perhaps you will use it for hunting though, because having the best of the best is not a bad idea when a single shot can be the difference between a freezer full of meat and an unforgettable outing, and disappointment until the next season. Hornady offers some of the best quality control specifications on the planet. The brass case with a Boxer primer means the round is reloadable, and the premium brass is just one perk to this purchase. 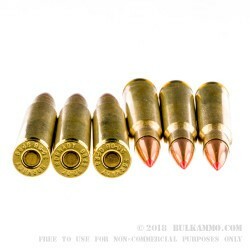 The 168 grain round is designed to work specifically in the M1 Garand for the CMP tournaments (Civilian Marksmanship Program) and other similarly sanctioned matches, but this round is super versatile. Out of the Garand you would find it hard to duplicate the accuracy and reliability of this particular load at the price point, or at any price point at all, out of the factory. Q: I see 30-06 Springfield ammunition listed. I also see some ammunition listed as 30-06 Springfield M1 Garand. 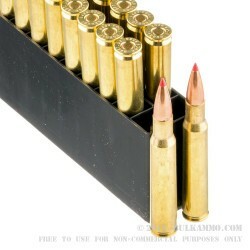 My question is are these 30-06 rounds interchangeable between modern hunting rifles and the M1 Garand and vise versa? A: Ammunition listed as being intended for the M1 Garand is loaded a little lighter than standard .30-06 ammunition. It will still function fine in other .30-06 rifles, but not all .30-06 ammo should be used with the M1 Garand, because it might be loaded to higher pressures that can cause excessive wear and damage.